What’s Happened to All The Pintails? They came in endless goose-like waves from Matagorda Bay that one-bluebird-morning in the late 1970s. Flock after flock riding light southeast winds, all beelining for a single flooded field west of the obscure town of Francitas. At least 5,000, perhaps upwards of 10,000 strong seeking recently harvested second-cropped rice, a morning spectacle unmatched in all my years of pursuing ducks along the Texas coast. I met my future wife Nancy that same morning, while lying on a muddied levee looking skyward at mind-boggling flights of sleek pintails spiraling tornado-like out of the heights above. The bag limit on pintails that day was 10 per hunter with close to one million birds wintering in Texas. Fast-forward 40 years to this past year’s duck season: Nancy and our two teenaged sons, Hunter and Forrest, watched in awe. A tableau for the first 30 minutes of rust-colored light as thousands of descending pintails fluttered 360 degrees around our blind, smothering our paltry decoy spread. Guns were idle that first 30 minutes of light, we just sat…and marveled. The bag limit on pintails this day was one per hunter with the mid-winter waterfowl survey counting only 176,871 birds, well below the 22-year Texas average of 600,000 birds. Today any Texas waterfowler fortunate enough to be in the midst of thousands of pintails will often retort the same, “No shortage of pintails here, what’s the problem?” My boys did that morning. But waterfowl managers across the nation know there is a big problem with the Northern Pintail. Starting in the mid-1990s, precipitation returned to the Prairie Pothole Region (PPR) of southern Canada and the northern plains of America. Populations of all puddle ducks species escalated to some of their highest numbers since the 1950s, but pintails languished well below their long-term average, disappointing sportsmen with reduced bag limits and perplexing biologists with a population that should have rebounded with conditions. These are troubling times for the Northern Pintail, the only dabbling duck that has been unsuccessful in responding positively to improvements to nesting conditions in the PPR. In the 1970s, western Canada had more than 20 million acres of fallow fields, but in 2017 there were just 1.77 million acres, a dramatic drop in nesting habitat for pintails. Many wildlife species adapt to changes in the habitat and environment. Mid-continental Snow Geese, for example, have taken advantage of milder winters and abundant rice in Arkansas for wintering as opposed to coming to their historic wintering grounds of coastal Texas. Pintails, on the other hand, appear to not be as adaptable, especially hens that have very specific needs when it comes to nesting. 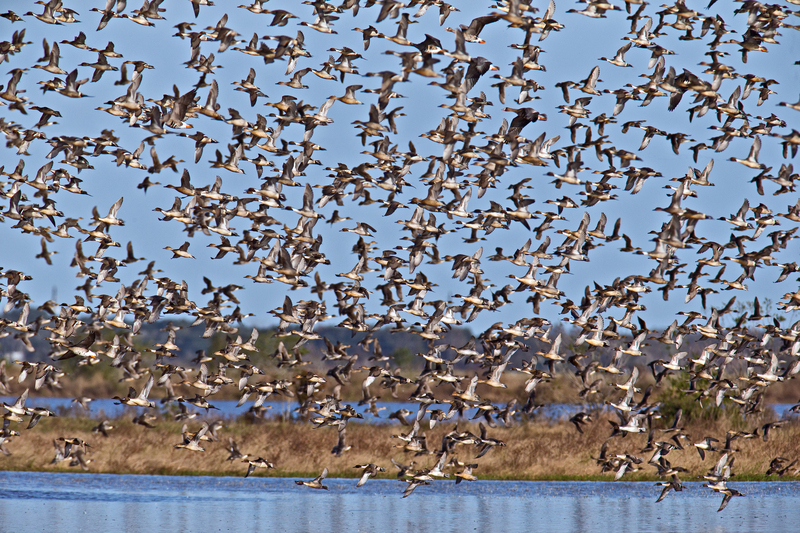 In years past, the Texas Gulf Coast has wintered upwards of 78 percent of the pintails in the Central Flyway. And as with the nesting grounds of the Canadian PPR, there have been intensive changes in agriculture along the Texas coast. Texas rice farmers have found, and still are finding, it increasingly difficult to maintain profitable operations with a surplus of world rice, depressed long-grain prices, increased costs of production and interruptions in water supplies due to drought conditions. Many farmers have had to convert from rice farming to row crops to remain viable. The decline of rice, especially along the Texas Mid-Coast, has reduced an extremely important food source for wintering pintails. In the 1960s, an annual average of 486,500 acres of rice was planted in Texas. The yearly average from 2010 to 2017 was only 162,750 acres, a 67 percent decrease. Adding to the problem is a sprawling Houston with accelerated westward expansion swallowing rice farmlands such as the Katy prairie that were once waterfowl meccas. 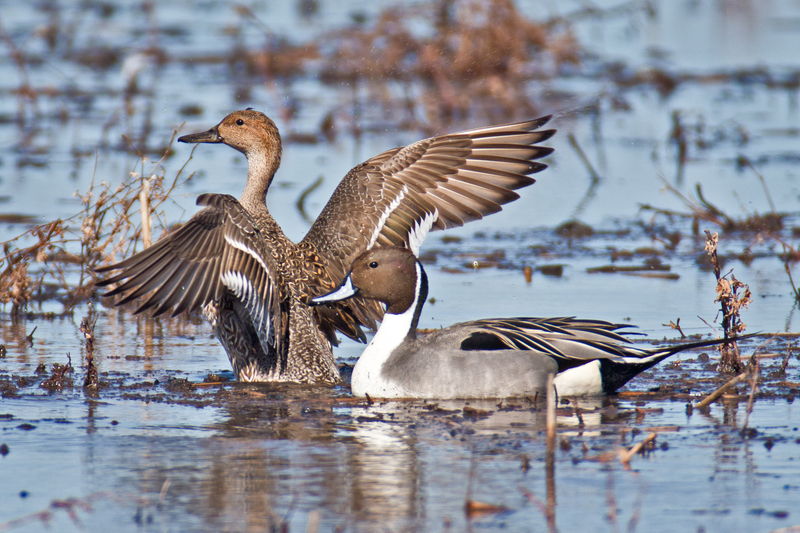 Pintails love rice and for good reason. It is a high-energy, carb-packed source of energy that produces crucial fat reserves for sheer survival during the winter as well as fuel for migration to spring nesting grounds. Pintails exhibit high winter site fidelity, but as flooded rice fields have disappeared across the Texas landscape, they’ve had to rely more on coastal bays for food sources. While there is an abundance of coastal food sources such as shoalgrass rhizomes, wigeon grass seeds and various marine invertebrates, their coastal bay diet is more of a “weight-watchers” diet than a calorie packed, high-lipid (fat) diet essential for their spring “marathon” migration north. 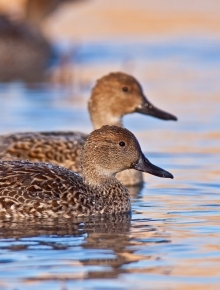 Dr. Bart Ballard, professor and noted waterfowl scientist for Texas A&M University-Kingsville, and his colleagues have conducted numerous studies on Northern Pintails. One research study on 253 pintails feeding along the lower Texas coast showed that the metabolized energy from the coastal waters was half of the energy value obtained on inland wetlands. According to another Ballard study, Pintail hens were actually losing as much as 20 percent of their fall arrival weight while wintering on the coast. Lowered fat reserves from poor wintering habitat has been linked to a reduction in spring brood size and at other times no nesting attempt. Additional research from Ballard shows evidence of significant physiologic stress on pintails from extracted blood metabolites from a third of the birds sampled on the wintering grounds. And yet another study showed alarmingly low survival rates of wintering hen pintails along the Texas coast as compared with other wintering areas across North America. All results are of great conservation concern. With the loss of rice in Texas came the loss of geese and subsequent loss of sanctuary roost ponds established by hunting guides up and down the entire upper and middle coasts. These roosts, financed by outfitters, played a large role in giving pintails refuge. Dr. Todd Merendino, manager of conservation projects for Ducks Unlimited, observed that pintails often mimic geese not only in feeding but in roosting habitats as well, preferring shallow flooded fields and rice. And as farmers were driven by economics to convert rice fields into row crops, the ability to effortlessly flood a rice field was lost. As high-quality food sources became less abundant on the Texas coast, pintails started to migrate out later, most likely trying to further build their fat reserves. “As pintails stay longer in Texas during the spring, they are more likely to miss the shallow sheet waters of the PPR they are hardwired to nest near,” Ballard said. Pintails are also lousy re-nesters and will abandon nesting when conditions are not ideal. Added to the problem of pintails struggling to gain winter fat reserves is the drainage of many duck ponds immediately after duck season ends in late January. If there was a most crucial time for pintails in Texas, it’s February and March, prior to their northern migration. Food sources late in the season are becoming scarce, and the drainage of ponds at the end of duck season only amplifies the problem. Unlike many other duck species, Northern Pintails rely on fat reserves gained not only on the wintering grounds, but on migration stopovers as well—refueling stops on their marathon flight to the north. Unfortunately, like their nesting and wintering habitat, the pintail’s migration corridor has undergone wide-ranging changes as well. Texas Parks and Wildlife Waterfowl Program Leader Kevin Kraai coins the stopovers “Hourglass Bottlenecks.” The Rainwater Basin in Nebraska, which hosts 30 percent of the continent’s pintail population during migration, has gone from 11,400 basins to 400 basins today. These small migration “bottlenecks” are playing an ever disproportionately large role as refueling stops for pintails. Although playa lakes or basins in the Central Flyway stretch from the Texas Panhandle through the Rainwater Basin and beyond, Kraai noted that the playa lakes of the Texas Panhandle have undergone a massive hydrology change. Playa lakes are filling in from erosion and are no longer effective clay “saucers” capable of holding shallow water as in the past. During the ’60s and through the ’80s, farmers in the region artificially flooded playas for irrigation of crops resulting in great wintering and migrating habitat for waterfowl. However, with groundwater now becoming more limited and valuable, farmers are going to more efficient sub-surface irrigation to save water—meaning no more artificial flooding of playas as in the past. What’s good for the aquifer is bad for waterfowl. Merendino noted that problems for pintails have occurred because of quantum changes and in all likelihood it will take grand scale solutions to return the much-needed balance. Part of the answer can be found in the conservation practices in North Dakota, the Conservation Reserve Program (CRP), where farmers are paid yearly in exchange for removing environmentally sensitive land from agricultural production and the planting of species that will improve environmental quality for wildlife. In 2016, North Dakota supported 378,000 breeding pintails, more than southern Alberta and Saskatchewan combined. Canada does not have a CRP but there is a relatively new program called Greencover Canada that compensates farmers for conserving wetlands and grasslands under the nation’s Agricultural Policy. 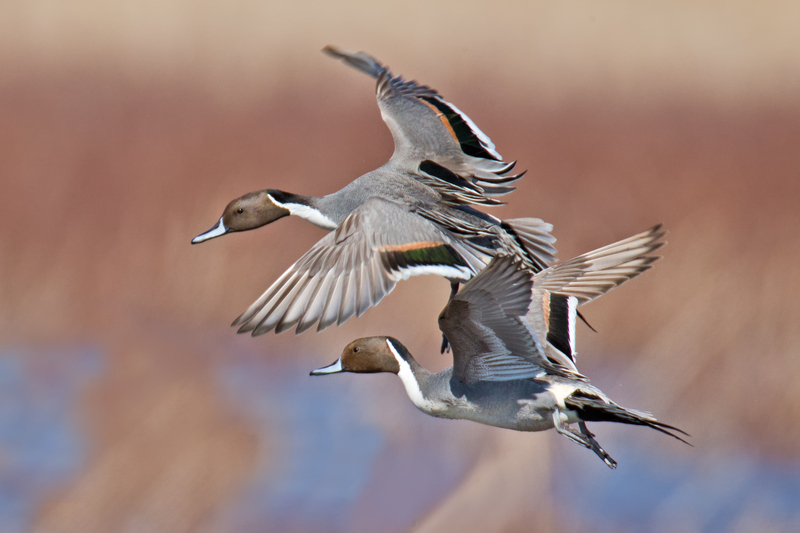 For years, Ducks Unlimited has recognized the importance of working with farmers to save ducks and has been focusing on fall-seeded cereal grains—winter wheat and rye—to provide higher-quality nesting habitat for pintails along with converting marginal land into optimum grass cover for ducks and cattle. DU’s “Rescue Our Wetlands” is a $2 billion conservation campaign that includes conserving habitat up and down the flyways including their flagship Texas Prairies Wetlands Program that cost-shares with landowners in making crucial wintering habitat for wildlife. Also being discussed is setting up a network of sanctuaries for pintails much like goose roosts of the past. The Lower Colorado River Authority is on fast track to build a new water storage reservoir north of Bay City designed to capture and store up to 90,000 acre-feet of water from the Colorado River as an additional source of irrigation water for rice and ducks. One of the brightest spots in all the landscape is what Kraai called, “The largest wildlife refuge in the United States: the rolling plains and oak prairies of Texas where an unbelievable number of ponds now exist.” Inconspicuously, one farm pond after another has been built over the past 40 to 60 years in the central part of the state and now number in the hundreds of thousands. Ducks are wintering more and more in these areas per the mid-winter waterfowl surveys. Although these are not purposely built for waterfowl habitat, each pond dotted across a vast landscape represents a mini-oasis of food and shelter for ducks—including pintails. Kraai and other research biologists are currently conducting studies to further understand the impact these ponds are having on wintering waterfowl in Texas. Whether one is hunting pintails along the Texas Gulf Coast or photographing their courtship flights in the Rainwater Basin, there is no denying they are one of North America’s most spectacular ducks, worthy of all efforts to understand their complex ways and to restore their dwindling population.